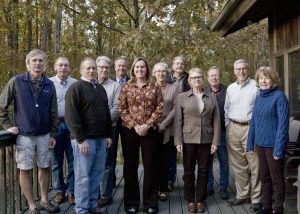 ACRES board members govern the organization, providing oversight and strategic direction. ACRES staff members ensure the protection of this land every day. Jason loves nature, and in particular, trees. At the age of five he declared that his life’s vocation would be caring for trees. 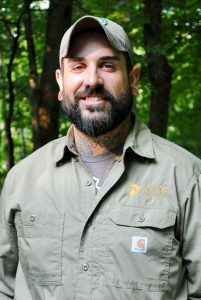 He stayed true to this vision by earning degrees in forestry and ministry, serving as curator of trees for the North Carolina Zoo, and natural resources administrator for the City of Indianapolis. In 2006 he became ACRES’ executive director, which means he ensures ACRES’ land, funds, members, volunteers, and employees receive the attention and resources they need to thrive. Jason’s favorite preserves are the ones that have been undisturbed the longest. Preserves with a century or more of time to function undisturbed provide a glimpse into the unique, healthy, and diverse systems that Forever will offer all ACRES’ properties. Heather wants to know why you protect land. From donor cultivation to writing grants, she listens to your dreams and goals for investing in this work. 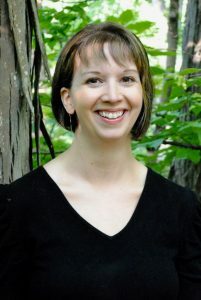 She pays careful attention, because her job is to connect you to possibilities to realize your personal aspirations with ACRES Land Trust. 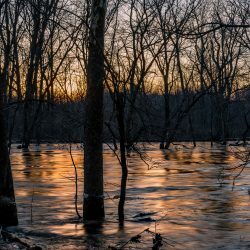 Her fondest memory is of walking trails with her daughter, then a toddler, listening to leaves rustling in the wind and imagining the secrets the trees were sharing of everything they had seen throughout their decades, sometimes centuries, of existence: Settlement, storms, development and all the creatures who lived among and enjoyed the company of trees, themselves included. Heather’s early work experience in customer service opened a door into the world of philanthropy and continues to provide the foundation for her passion for working with members and donors. 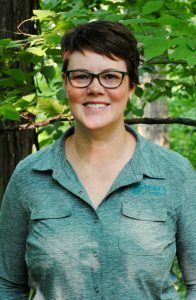 Her position with ACRES is the perfect marriage of her personal core values of preserving natural areas and her experience as a professional fundraiser. the day, the weather, and what each preserve needs. Heading into the rain, chainsaw in tow, Matt says, “That’s what I love about the job. There is no typical day. 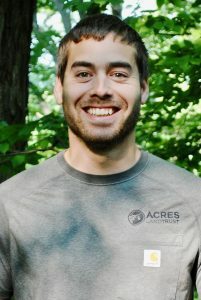 Tomorrow will probably be completely different.” Prior to joining ACRES, Matt most recently served as part of the Crowe Forest Management team, and he volunteered and worked under contract for ACRES. He is experienced in woodworking, carpentry and cabinet-making. Lettie shares our stories. 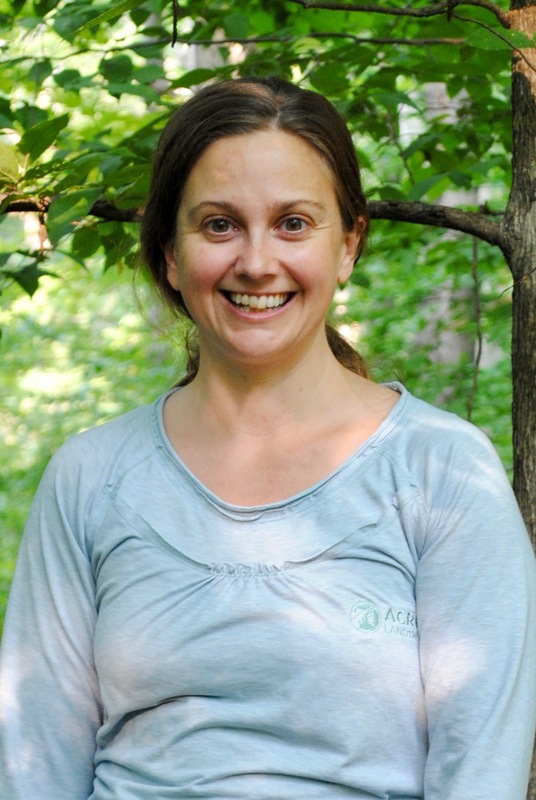 She aims to inspire and welcome you to this work and to the ACRES community. To do this, she works with contractors, staff and volunteers who write, edit, speak, create, photograph, host, teach, design and in so many ways continually share what it means to protect the land we all love for future generations. Lettie brings to ACRES training and support from a variety of teachers. Most recently, she served as a public librarian with the Allen County Public Library’s Paul Clarke Nonprofit Resource Center. Practicing yoga deepens her appreciation of the natural world. On the Tom and Jane Dustin Nature Preserve, she met a mink. 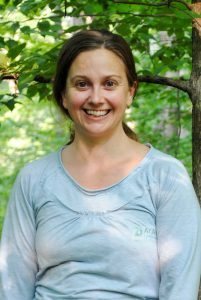 At Mengerson Nature Preserve, she shared muddy trails with her daughters when they were toddlers. In the back of Hammer Wald, she found a giant sugar maple bathed in light. As a kid, Lettie felt most at home in open, natural spaces. At some point, like many of us, she lost touch with this sense of belonging and is astonished to find herself celebrating the natural world with you. Evan works the land you love. 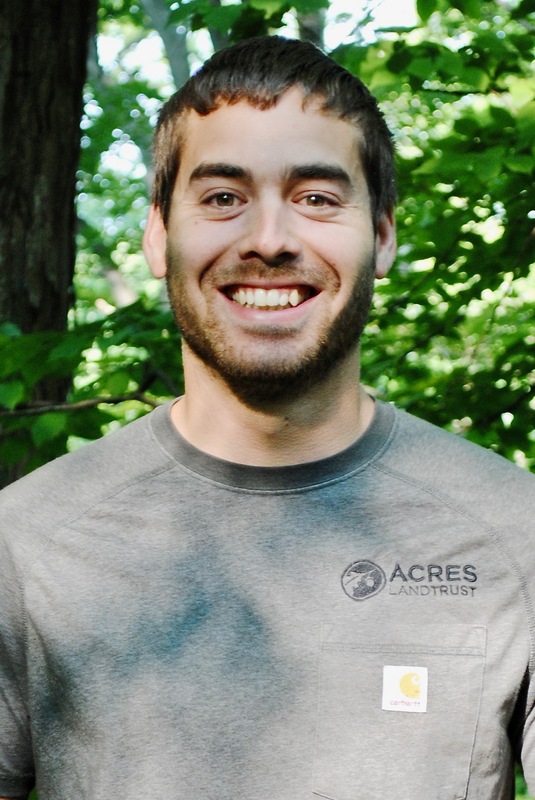 Whether his day entails marking property boundaries, creating and maintaining trails, or leading interns in our battle against non-native invasive species, he spends much of his time caring for the land. From a very early age Evan was fascinated by the complexity of nature. 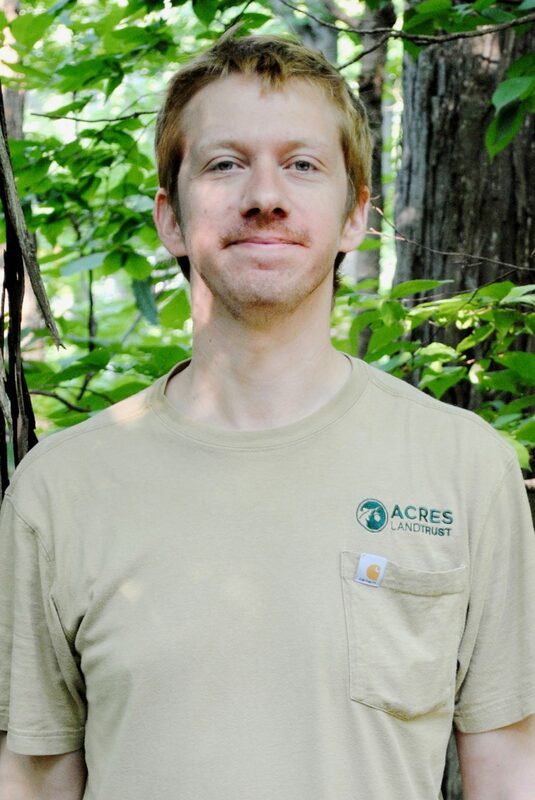 Evan’s background in wildlife and habitat management is rooted in a Wildlife degree from Purdue University. 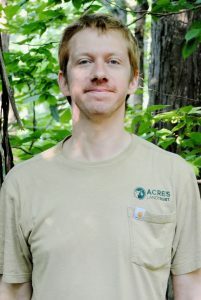 Twice a summer intern with ACRES, he also acquired wildlife experience with the Colorado Department of Natural Resources. Casey directs the management of our land. 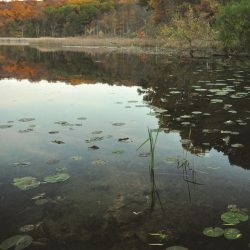 He determines how, when and what kind of non-native invasive plant species are eliminated. He works with a team of “ologists” – geologists, biologists, hydrologists and more – to make informed decisions. 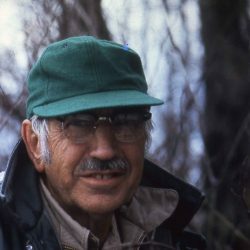 He establishes if a preserve can be open and where trails go to protect sensitive areas while encouraging your appreciation of the natural world. He guides our restoration and reforestation projects and he meets with families and individuals who want to protect their land with ACRES. Like many of us, Casey had formative encounters with wildlife as a child. He continues to seek these experiences as an avid birder. He brings to ACRES experience in the field and a background in art and design. 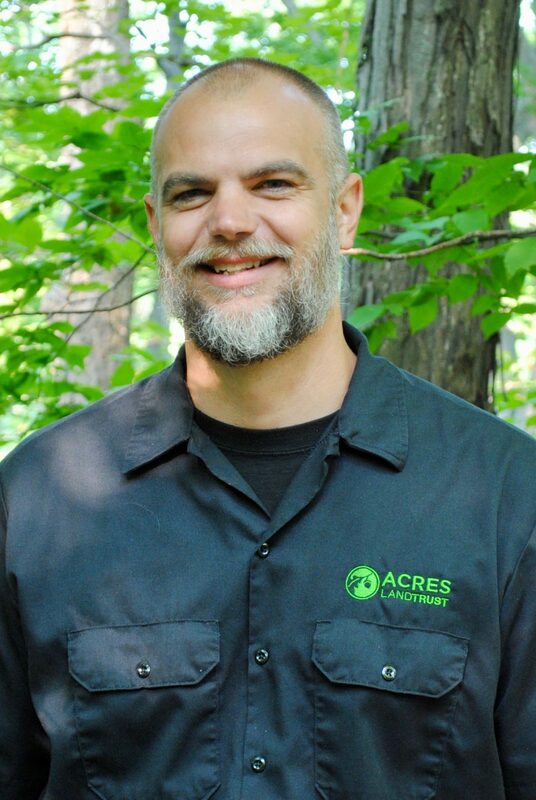 Flowers Creek and Wayne Township Prairie may not be Casey’s favorite preserves, but he invests plenty of sweat equity in restoring the Miami County and Kosciusko County properties along and near the Eel River. Natasha keeps ACRES running by caring for our daily office and volunteer management needs. She ensures that our supporters’ funds are processed, that our vendors are paid. She works to welcome new volunteers and to retain our established crew. Natasha greets visitors, answers phones and serves staff needs with supplies and planning. Natasha’s appreciation and passion for natural places took hold in adulthood, fostered in time by observing her mother’s committed care for a collection of house plants. From this love for plants, Natasha, her sister and their mother grew into avid gardeners, sharing bulbs, seeds and advice. “I was not an outdoorsy child or adolescent! My love of nature began with plants, indoors. In my early twenties, I moved from northeastern Indiana to Washington State and began hiking. I was wild about the enormous ferns and moss drenched forests of the Pacific Northwest. I would seek out new city, state and national parks to visit and hit the trails. I found that spending time in natural places filled me with a deep sense of awe and joy that I did not experience elsewhere. Natasha’s professional background is in accounting and human resources; she has worked in the industries of construction and higher education. Volunteers serve ACRES in many ways. A few folks serve in weekly office roles.